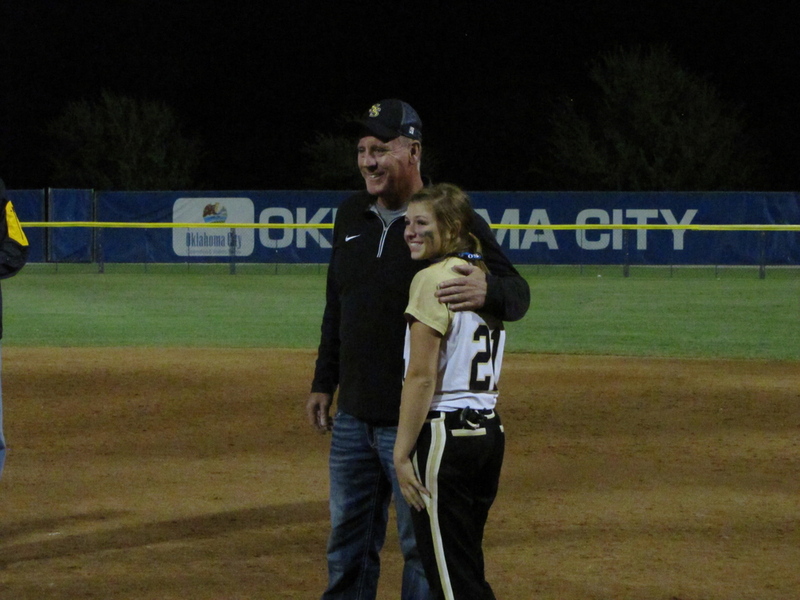 It was an emotional night for the Sand Springs Lady Sandite softball team. Years of hard work, a 13-1 district record, and a Regional Championship brought the girls further than any Sandite had been in their lifetime. The Sandite Magic failed to show itself in a Saturday night 4-3 loss to Choctaw, but the Sandite talent and hard work showed itself every step the way. Though they may not have brought home the first ever state title for Charles Page, they did make runner-up for the first time since 1996. It may not be what they were hoping for, but still a damn impressive run and something to be proud of. Sometimes teams lose because they don’t play their best. Sometimes teams lose because they didn’t want it badly enough. Neither was the case for the Charles Page sluggers. Sometimes things just don’t work out. One thing was clear, however. 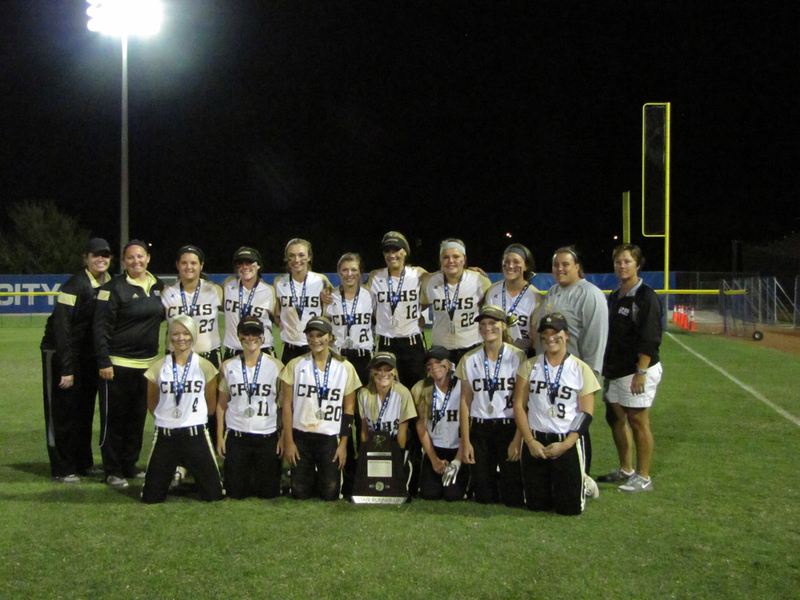 Nobody could have wanted that title more than our girls, and they gave their full 100% every step of the way. Senior Kennedy “Goose” Salyers got the loss on the mound, only her second of the season, and finished with a 17-2 record. Salyers will go on to play for Southeastern Oklahoma State University. Chenise Delce, a University of Tulsa-commit, got the win for Choctaw. It started off quickly enough as Paige Russell, the first batter up, connected for a single on the second pitch of the game. She wouldn’t remain on base for long, however, as she was thrown out at third by first-baseman Jessica Schuler. Schuler is going on to play college ball at Northeastern State University. 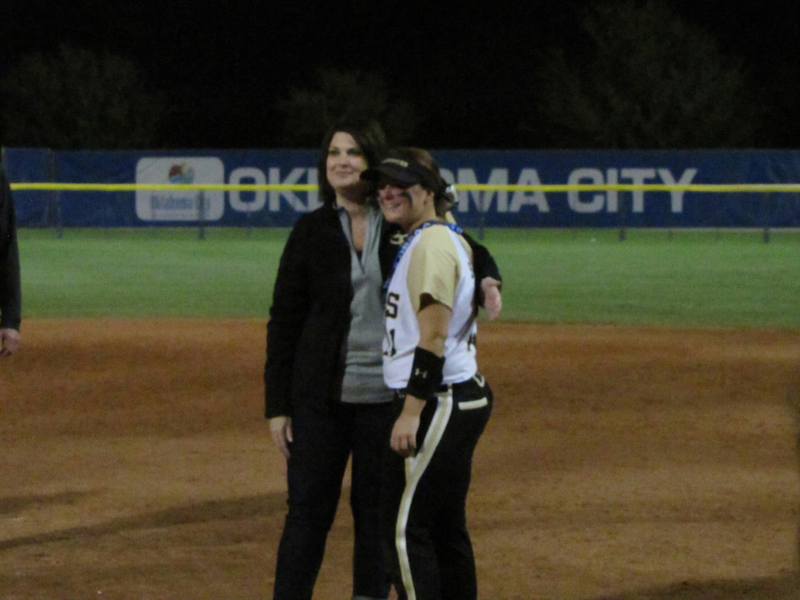 Jamie White was the third Lady Yellowjacket to get on base with a single, but both her and Katie Long would end up stranded. Delce pitched a no hitter in the first inning and brought her team in give their bats another try. They managed a single, but this time it was Erika Vessels left stranded. 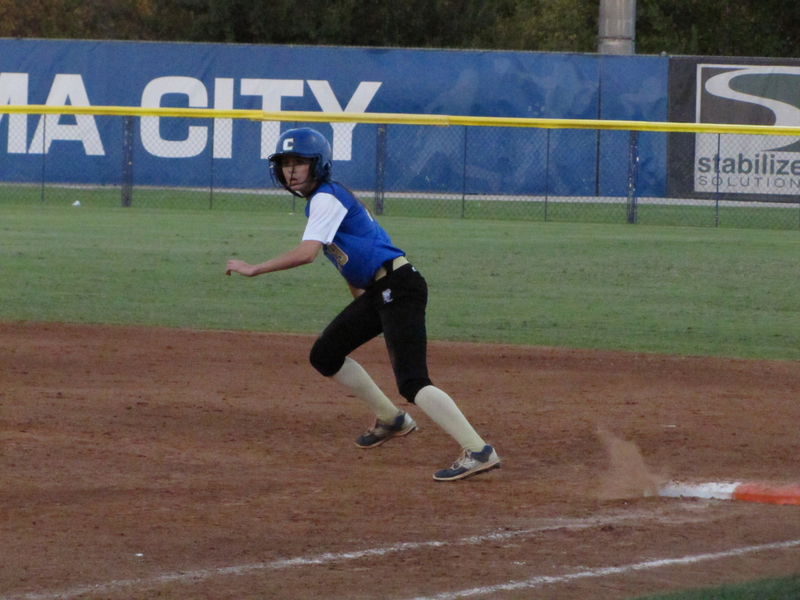 Sand Springs finally got on base in the bottom of the second inning with a walk by Jessica Collins. 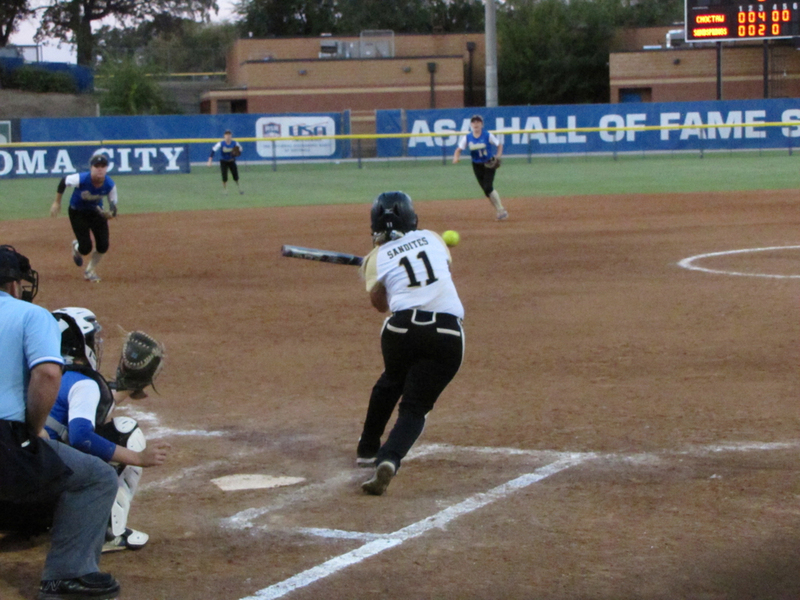 Simply getting someone on base was a momentum starter for Sand Springs and Rachel Blair followed her with a single-by-error. Both were left stranded going into the third, but the team had found their legs. 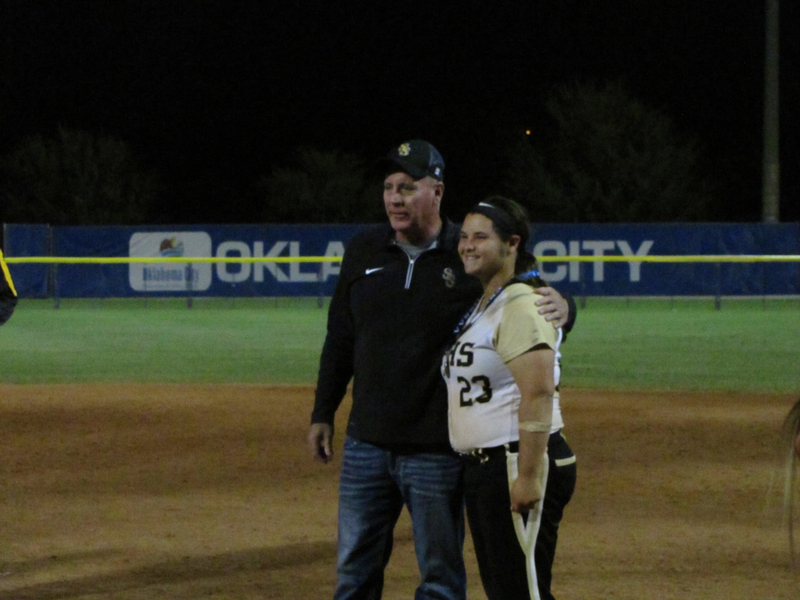 The magic inning came in the third for Choctaw as Long and Jamie White both hit singles. Haley Pomplun connected for a massive double to score Brooke Edwards (the courtesy-runner for Long), and on the next play Allyssa Sievert hit a double of her own to score White. With a 2-2 count and two outs, Kennedy Henry found the right field fence for a 2RBI Single and a 4-0 lead. Those would be the only runs the Yellowjackets would score, but it would be enough. Sand Springs came ready to do major battle. Madelyn Blair smacked a single into right field, Salyers smacked a single into left field, and Stella Millican drew a walk. With the bases loaded, Schuler grounded for a single that scored both Blair and Salyers. 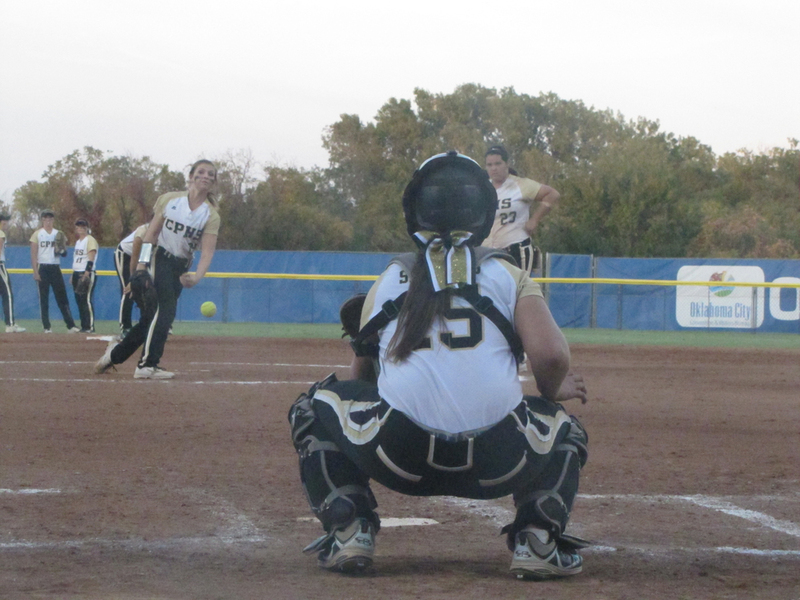 Unfortunately, the Choctaw defense was just too fast for Millican to find home plate. Sand Springs had closed the gap to 4-2 going into the fourth, but they wouldn’t find home plate again till the bottom of the sixth. 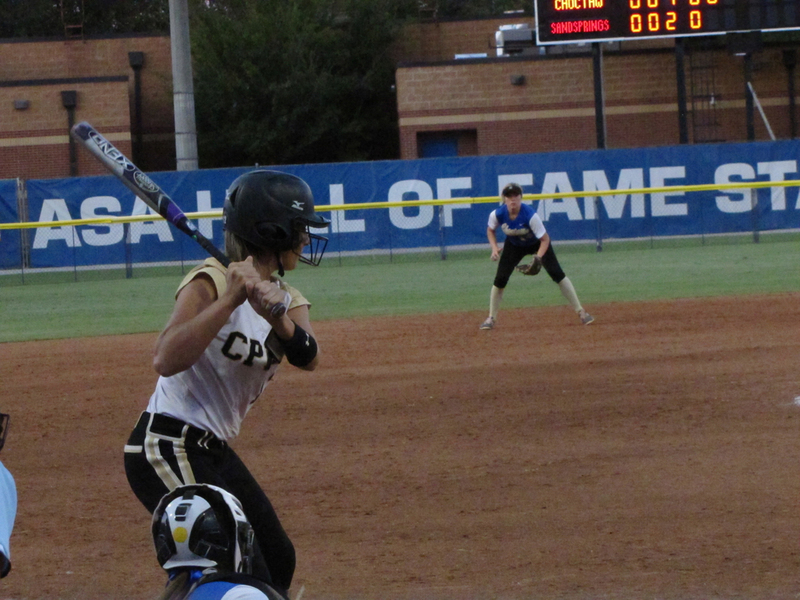 Defensively, the Sandites excelled, stranding three on loaded bases in the fourth. Sydney Pennington, a junior Oklahoma State University-commit, caught a pass from Kimi Presnell to out Brown on second and assisted Schuler on outing Delce at first in a beautiful double-play in the fifth. In the bottom of the fifth, Salyers hit a single and Millican tried to sacrifice bunt to move Salyers ahead. Unfortunately, the Yellowjacket defense opted instead to out Salyers and Millican would be ultimately be stranded at second with Pennington on first. 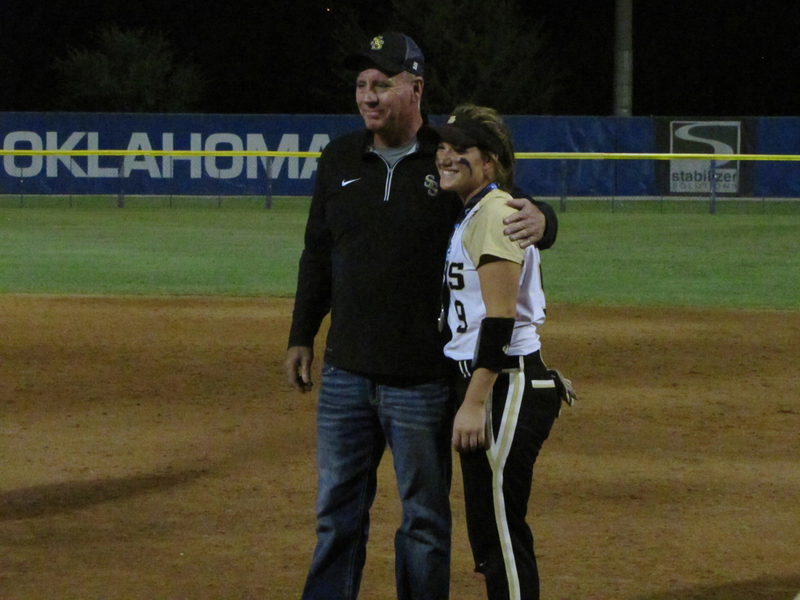 Of the six Sand Springs seniors we’ll be losing, Stella is the third to be going to college, having committed to Mid-American Christian University earlier this season. The final Sandite run would come in the bottom of the sixth. Collins hit a lead-off double into the left field fence. Rachel Blair was next at bat and sacrificed herself on a line drive to White. White tried to catch Collins off base on second, but instead, Collins capitalized on a massive overthrow error and came home to thunderous applause. Presnell tried to tie things up, drawing a walk before stealing second on a catcher’s error. Unfortunately an infield fly from Salyers left her stranded and it came down to the final inning. Seivert singled and Brown nailed a double and it looked like Choctaw was lining up to put icing on the cake. Instead, it was Pennington who stole the show, catching a line drive from Henry then tagging out the runner on second for a single-handed double play to bring in the Sandites for one last chance. Pennington grounded for a single, but it would be the final hit of the season for the Lady Sandites. This game reminded me of the classic question, “what happens when an unstoppable force meets an immovable object?” Ultimately, it wasn’t that the Sandites were outclassed, or even that they beat themselves. It was just the luck of the draw as both teams showed up and played their hearts out.